Ethically made right here in the UK by our dear sister, TotsBots. Inspired by Amelia Bloomer, the early American feminist, fierce advocate and supporter of the Victorian Dress Reform; we too are encouraging women to have a cycle in comfort and style. Waterproof bathroom storage bag & waterproof wet/dry out and about bag. Bold, beautiful, bamboo to brighten up your dreary period days. Perfect for those who prefer natural fabrics next to skin. We have 4 sizes to meet every shape and flow, mini, midi, maxi and mighty. 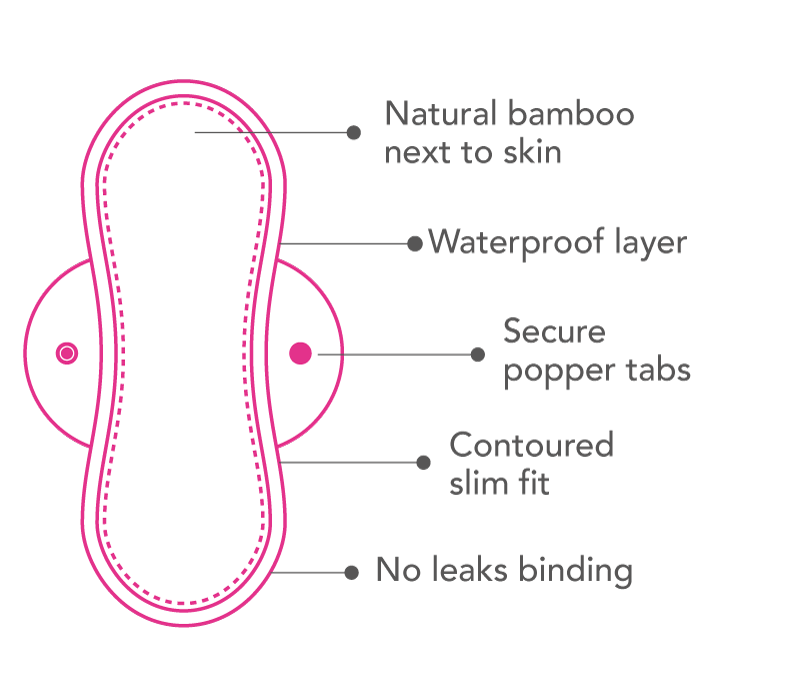 The unique stay dry binding is the perfect barrier against leaks and keeps everything in the absorbent bamboo core. 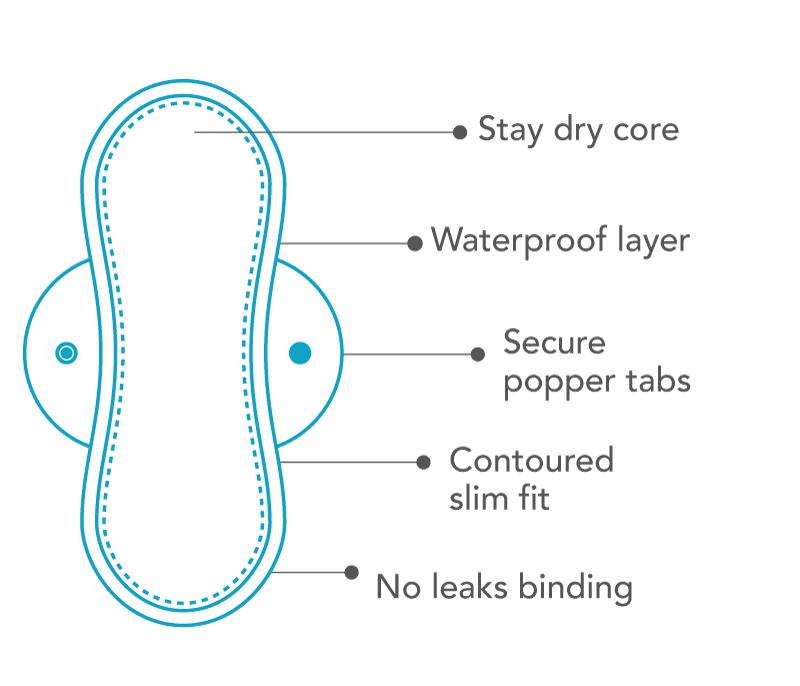 Whilst our reusable pads are more absorbent than disposables and should last that bit longer, we recommend changing every 4-6 hours, with the exception of mighty pads of course as they are designed to see you through the night. Down with the indoor airer! You can be loud and proud and hang these Noras on the line. If bright-whites are more your cup of tea, then Noras are for you. They have a soft stay dry interior that repels stains and will keep them looking in tip-top condition for years to come. It also makes them suitable for light incontinence, so you can now sneeze in confidence with Noras. The super-soft stay dry binding gives maximum ‘in the bloomers’ performance and come in 4 sizes to meet every shape and flow. Simply hand rinse in cold water immediately after use and wash within 48 hours. A question we are most understandably asked is “What do I do with my used pads?” so in the interests of causing undue alarm to the unsuspecting bathroom user, we recommend keeping your soiled pads in this lovely little zipped waterproof bag. You just pop this whole thing in the wash with your pads (opened of course) and they will tumble out refreshed and ready to go for another cycle. Once you are fully into the swing of things with your pads, this clever little bag is the perfect travel companion for using when out and about. With two separate waterproof compartments for used and unused pads, you can safely carry up to 4 pads on the go. Simply wash with your soiled pads and re-use.